DURHAM: Mary Myrtle Weaver, 78, passed away on Saturday, November 17, 2018 at Transition Life Care Hospice Home in Raleigh. She was born in Robeson County, North Carolina, the daughter of the late Raymond Harris and Ester Carpenter Harris. Mrs. Weaver was preceded in death by her husband Clifton Starnes Weaver, brothers, Linwood and James Harris; and sister Peggy Hall. Mrs. Weaver is survived by her daughter Lu Anne Workman and husband Jim, sisters Minnie Melvin, Patricia Sharpe and Carolyn Hall; granddaughter, Amanda Ridge and husband Ryan, and great grandchild Owen Ridge. A funeral service will be held Monday November 19, 2018 at 2pm at Clements Funeral Chapel in Durham with Dr. Scott Gray and Pastor Derek Ketner officiating. The family will receive friends prior to the service from 12:30 to 2pm. Burial will be Tuesday November 20, 2018 at Oak Grove Memorial Gardens in Durham at 2pm. 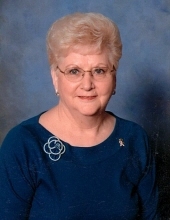 To send flowers or a remembrance gift to the family of Mary Myrtle Weaver, please visit our Tribute Store. "Email Address" would like to share the life celebration of Mary Myrtle Weaver. Click on the "link" to go to share a favorite memory or leave a condolence message for the family.